Hanoi (VNA) – Prime Minister Nguyen Xuan Phuc has said the establishment of the Vietnam-Brunei comprehensive partnership will open up new chapters for the bilateral relations. At a meeting with visiting Sultan of Brunei Haji Hassanal Bolkiah in Hanoi on March 27, PM Phuc suggested the two countries increase all-level delegation exchanges, as well as meetings and consultations at multilateral forums in order to ensure the freshly-established bilateral comprehensive partnership develops effectively and pragmatically, and matches potential and position of each side. Furthermore, they should optimise bilateral cooperation mechanisms to tighten political ties, promptly remove difficulties, and promote collaboration, he said. The leader expressed his delight at the active development of the Vietnam-Brunei relations across fields, and noted that the Asia-Pacific and the Association of Southeast Asian Nations (ASEAN) regions in particular are witnessing intensive changes in all spheres, requiring each country to make suitable adjustments in development models, economic management and response to new cooperation initiatives. He urged the two countries to join hands in organising the second meeting of the Joint Commission for Bilateral Cooperation slated for 2019 in Brunei, and consider establishing more political consultation mechanisms and joint trade committees. The leader also suggested promoting cooperation in national defence and security – a highlight of the bilateral ties, given the rapid and unexpected developments in regional security. PM Phuc also called on the two sides to soundly implement cooperation agreements in defence and security, step up joint training in search and rescue operations, increase visits of naval ships, and closely coordinate at international defence and security forums. It is necessary to beef up bilateral affiliation in preventing and fighting non-traditional security risks such as terrorists, cross-border crimes, drug smuggling, human trafficking, and high-tech crimes, he said. The two sides need to pay attention to and deepen economic ties with new, balanced and mutually beneficial approaches, while supporting each other to utilise opportunities generated by the regional economic integration and the Fourth Industrial Revolution, aiming to soon reach the target of raising the bilateral trade to 500 million USD, he said. The PM also proposed that the two countries intensify trade promotion activities, such as exhibitions, fairs, and business forums, as well as support for their enterprises to network and exchange information. The two countries should increase two-way investment and create an open legal foundation and an optimal business environment for their enterprises to seek investment opportunities, especially in new economic areas that match the demands of the economic restructuring and modernisation targets of each side, such as infrastructure development. Due to their strategic geographical location, Vietnam and Brunei should pay more attention to sea cooperation, and take it as a pillar in their comprehensive partnership. He hailed the Vietnamese Ministry of Agriculture and Rural Development and the Brunei Ministry of Primary Resources and Tourism for establishing a hotline for fishery support, and requested that the two ministries promote the efficiency of the hotline and enhance information exchange not only in fishing activities, but also in search and rescue work. Praising the two countries’ shared vision on regional and global issues of mutual concern, PM Phuc affirmed that Vietnam always prioritises and seeks to join hands with Brunei to accelerate the implementation of the ASEAN Community Vision 2025, particularly as Vietnam and Brunei are due to take on the rotary ASEAN Chairmanship in 2020 and 2021. Both nations should coordinate to promote the ASEAN’s role in the region’s strategic issues, he stressed. Regarding the East Sea issue, PM Phuc said that it is important to ensure peace, stability, security, safety, and freedom of navigation and overflight in the waters while respecting international law, including the 1982 United Nations Convention on the Law of the Sea (1982 UNCLOS), fully and strictly implementing the Declaration on the Conduct of Parties in the East Sea (DOC) as well as soon finalising the code of conduct in the East Sea (COC). Sultan of Brunei Haji Hassanal Bolkiah, for his part, informed PM Phuc that he had a deep discussion with Party General Secretary and President Nguyen Phu Trong on various issues of mutual concern and witnessed the signing of a memorandum of understanding on the prevention of illegal fishing. He expressed his joy as both nations lifted the bilateral relations to a comprehensive partnership. 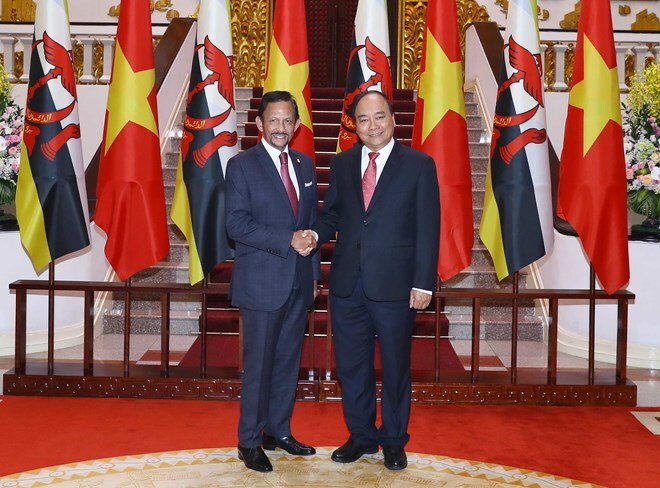 As Brunei is making efforts to diversify its economy through the development of various industries and its small- and medium-sized enterprise community, the country wants to boost both bilateral and multilateral cooperation with Vietnam, he stressed. Vietnam and Brunei have been engaged in many free trade deals, he said, stressing that businesses from the two countries should support each other to expand their markets. He added that economic connection will facilitate people-to-people exchanges, while helping companies and investors meet and set up partnerships. Both countries have enjoyed sound cooperation in the field of energy, and Brunei always welcomes Vietnamese firms to join the construction and maintenance of energy projects in the country. The Brunei Sultan spoke highly of Vietnam’s technical support for Brunei to branch out agriculture and said that they boast huge potential for further cooperation in this sector. Touching on the issue of national defence, he said that both nations should continue working together to handle and respond to traditional and non-traditional challenges. He took the occasion to congratulate Vietnam for taking on the role as ASEAN Chair in 2020, affirming that Brunei will promote cooperation and solidarity with Vietnam to build a strong and resilient ASEAN Community based on the principle of agreement and non-interference in each other’s internal affairs. Brunei hailed advancements in the negotiations of the COC. Relevant parties will continue practical cooperation in the framework of the DOC, helping consolidate trust to maintain peace in the East Sea. The Sultan congratulated Vietnam’s passage of the Comprehensive and Progressive Trans-Pacific Partnership (CPTPP), adding that his country will soon ratify the pact and coordinate with Vietnam to finalise negotiations for the Regional Comprehensive Economic Partnership (RCEP) this year.